Tommy Mars (born Thomas Mariano on October 26, 1951) is an American keyboard player known for his work with Frank Zappa. Mars began piano lessons at age eight, and later his instrument range expanded to various keyboards and synthesizers. Mars graduated in 1972 from the Hartt College of Music in West Hartford, Connecticut. From there he struggled to hold a variety of musical jobs including choirmaster, church organist, movie accompanist and more. In a 1980 interview in Keyboard magazine, Mars described one of the more unusual jobs he had as follows - "I was working in this revolving organ bar in Kodiak, Alaska, with Japanese and Russian fishermen kicking me in the back if I couldn't play an ethnic folk song to their drunken satisfaction". Knowing nothing about Zappa except for the songs "King Kong" and "Peaches en Regalia", Mars was asked to audition for Zappa's band with the help of percussionist Ed Mann, also a member of Zappa's group. From 1977 to 1982 he was part of Zappa's touring band, appeared in the movie Baby Snakes, and recorded a number of Zappa albums. After his work with Zappa, Mars alternated between teaching and touring with Steve Vai or Stuart Hamm. In mid-1990s, Mars formed The Band From Utopia, a group consisting of 10 Zappa band alumni, performing Zappa's music as a tribute band. 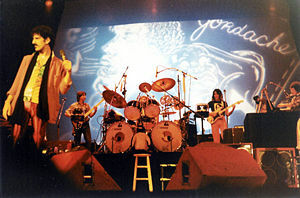 In 2007 Strange News From Mars was presented, a jazz hybrid with Jon Larsen, on Zonic Entertainment, featuring Bruce Fowler, Jimmy Carl Black, Arthur Barrow, and other Zappa alumni. 2008 Tommy Mars has a brief (three tracks) appearance on The Jimmy Carl Black Story, together with the original Mothers of Invention drummer Jimmy Carl Black. Spring 2009 was the release of the 2005 recorded No Forest Fire: Tommy Mars together with The Band From Utopia members Bruce Fowler, Walt Fowler, Kurt McGettrick, Larry Klimas (not from TBFU), Arthur Barrow, and Vinnie Colaiuta. In 2010 Tommy Mars recorded the surrealistic audio book Willie Nickerson's Egg, written by Jon Larsen, released in 2011. At the Molde Jazz Festival 2014 Tommy Mars performed Willie Nickerson's Egg live (three sold out concerts), together with Arthur Barrow, Arild Andersen, Jon Larsen, etc. ^ "Frank Zappa has had such a varied career". Contemporary Keyboard. 1980. Retrieved April 7, 2013.